Pancakes without yeast - a delicious, fast and affordable version of the famous cakes. These pancakes are cooked much faster than yeast, but taste is in no way inferior. - 1/2 teaspoon of baking soda. 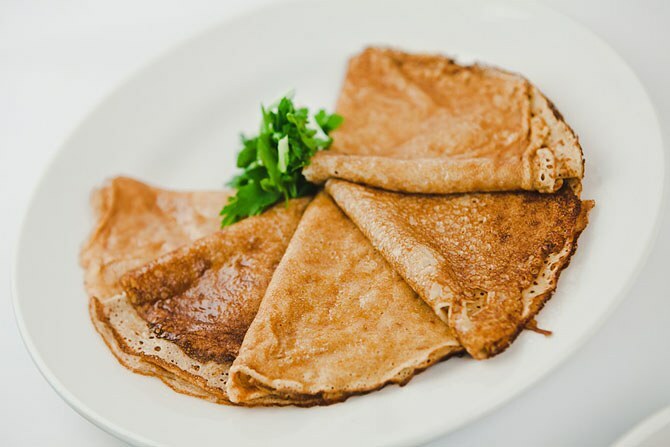 To bake pancakes without yeast, take a large deep bowl or dish in which you will prepare the dough. Break in a dish two eggs, then add sugar in the required quantity and thoroughly whisk the ingredients until frothy. Continuing to whisk eggs with sugar, gradually start adding the milk. Better if it is not cold, and room temperature. Next, add baking soda and salt, mix well ingredients ensure sugar is completely dissolved, and the mixture was homogeneous. Gradually start to add in a bowl the sifted flour, do not forget to stir to avoid lumps. Pour all the required amount of flour. The consistency of the batter should resemble thin sour cream. After you carefully mix the ingredients, pour in to the dough for pancakes three tablespoons of vegetable oil and mix again. Vegetable oil you can substitute butter. Left to make pancakes. To do this, prepare the pan, pre-lubricated it with a small amount of vegetable oil. Place frying pan on medium heat and preheat it well before you pour out the first portion of the test. Pour into the pan a small amount of dough, bake the pancake for 25-30 seconds on each side. When the first pancake is baked, you can try it for sugar, if the dough is fresh, add required quantity of sugar and continue to bake pancakes. When the pancakes without yeast are ready, fold them in a pile and serve. Speaking of which, the filling for this delicious pancakes you can come up with the most diverse. It can be caramelized apples or other fruits, cottage cheese, whipped cream, honey, berries, or meat filling, boiled egg, cabbage, fried mushrooms or potatoes. If after baking you cover the pancakes with a lid, after a while they will become more soft, for greater efficiency you can brush them with a small amount of butter. The amount of sugar in the dough can be changed depending on the intended filling for pancakes, meat and savory toppings be omitted entirely. To give the pancakes without yeast originality, add directly to the batter with vanilla, cinnamon, pureed berries and fruits, and sugar substitute honey.